A diamond weighing 76.07 carats was mined by Russia’s Alrosa, one of the world's largest producers of diamonds. The company plans to put the rare gem up for auction at a price of more than $430,000. The big diamond, found in the Russian republic of Yakutia, has been dubbed “70 years since Victory in the Great Patriotic war [the way Russians refer to the conflict between the Soviet Union and Nazi Germany],” as a tribute to the anniversary of the defeat of Hitler, which will be celebrated in Moscow on May 9. Despite diamonds of this size being extremely rare, this is the fourth big stone found in the Yubileynaya diamond field in the last two years. 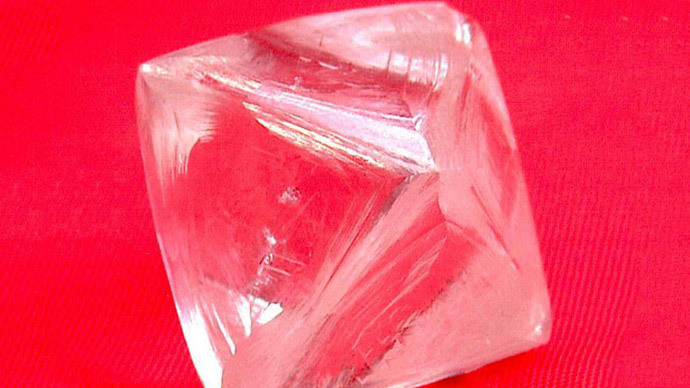 The crystal is transparent with a yellowish tinge and has in the form of an octahedron, the company reported. The crystal has small inclusions of olivine in the peripheral part and a discoid crack filled with graphite-sulfide composition on its surface. In December 2014 Alrosa sold a diamond weighing 47.5 carats for $1.8 million at Sotheby's in New York with a starting price of $900,000. The diamond was made of a crystal weighing 128.44 carats, and was also found in Yakutia. The company plans to sell 40 million carats of diamonds in 2015 (compared to 36 million carats in 2014). Alrosa accounts for about 25 percent of world diamond production and 95 percent of all diamonds mined in Russia. It operates in the republic of Yakutia and the Arkhangelsk region. The Russian government and the government of Yakutia hold 43.9 percent and 25 percent of Alrosa’s shares, respectively. The world's largest producers of natural diamonds are Russia, Congo and Botswana, which together provide 60 percent of world diamond production.